Appellate Representation. I have briefed, argued, and won cases before the Texas Supreme Court, the Fifth Circuit, and Texas's intermediate appellate courts. Amicus Briefs. I understand the unique role that an amicus can play in the appellate process. 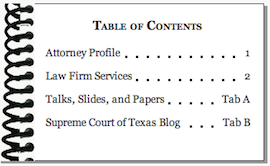 Over the years, I have written amicus briefs to the Texas Supreme Court, the U.S. Supreme Court, and intermediate Texas courts. Dispositive Legal Motions. A well-crafted and researched legal motion can win a case before trial or lay a solid foundation for a future appeal. An Appellate Lawyer at Trial. Many appeals are won or lost based on choices made in drafting a jury charge or objections made at a charge conference. Post-Judgment Motions. Although it is rare that a trial court changes its mind after signing the judgment, these post-judgment motions can be a crucial step in preserving error for appeal. Research into the Docket. If you are framing (or opposing) a petition for review, it can be crucial to know how your issues fit with other petitions that are pending on the court's docket. Writing and Editing. I sometimes consult with other attorneys by editing their draft legal briefs. This can be the most efficient way to convey feedback about strategy and to help reframe your existing legal argument for an appellate audience.